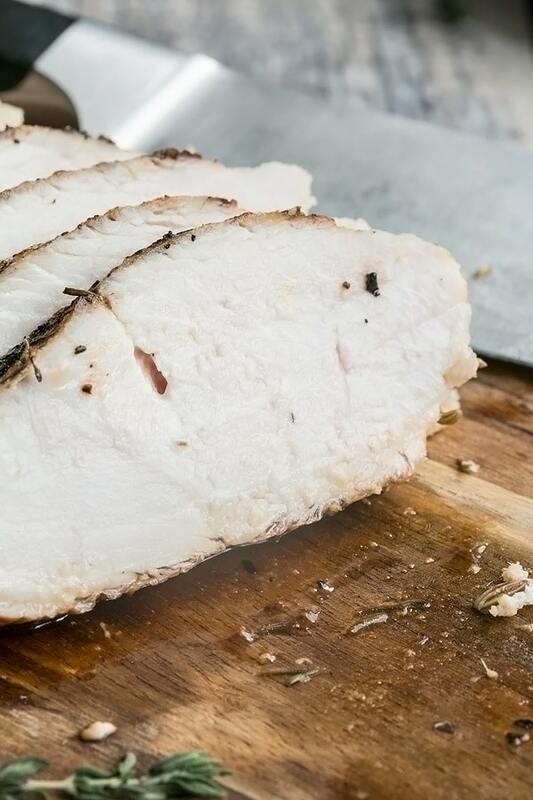 Making perfect, juicy baked chicken breast is super easy. This is the same method the restaurants use and it creates baked chicken with a nice sear on the outside and a juicy, tender inside. Eat it as is, or meal prep to make dinner easy by storing it in the fridge for using in salads, pasta, pot pie, stirfry, or whatever else you like. Have you ever eaten baked chicken breast that’s tough and rubbery rather than tender and juicy? I have and I would almost rather eat dirt. Serious! Before I knew the trick, I NEVER ate baked chicken breast. I used to chop it up first and fry it in a frying pan and it would get some color, but it would still be dry and not very appetizing. I tried baking it in the oven, but it pretty much turned out the same way except for without the color. Sometimes it ended up tasting all rubbery too. Then one day, I watched a show on the Food Network, and the host of the show let the viewers in on the secret of how restaurants cook chicken breast to make it juicy and flavorful. I have not had a dry and rubbery baked chicken breast since. Now whenever I make it, it has nice color and it is always juicy and tender inside. The secret is to brown the chicken in a hot pan on both sides and then slide the pan into a pre-heated oven for a few minutes. That’s it! Of course you can spruce it up a bit if you sprinkle your baked chicken with herbs and spices before you throw it in the pan or make a quick sauce in the pan once the chicken is done. I often use a Cajun spice or a Greek mixture. Once you have a bunch of baked chicken breast ready to go, the possibilities are endless. I always have a few baked chicken breasts in my fridge so that it’s ready and easy for me to make dinner with. Having that part of the dinner done and ready to go makes my life so much easier! thaw your chicken fully if it has previously been frozen. Cut off all the extra fat and any bits of bone or tendon. preheat your oven to 350 degrees. Get your oven proof frying pan nice and hot over medium or medium-high heat. when the time is up, take the chicken out and let it rest for at least 10 mins before slicing. Choosing quality meat is especially important for the health of our families and planet. 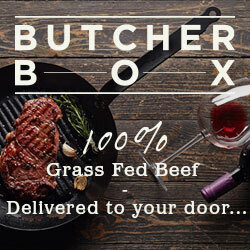 We’re so thankful for companies like Butcher Box who sell quality grass fed and pasture raised meats and truly care about the welfare of the animals. Even better, they have a fabulous price point and your order is delivered directly to your door! 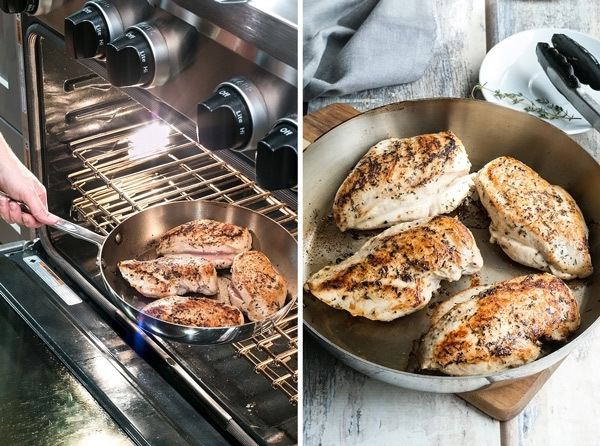 Everyone’s oven and stove is a little different and it may take a little time to figure out exactly what temperature on the stove produces a nice sear on your chicken, and how long it needs to stay in your oven. For my gas stove, I get a great sear at medium heat on the stove, but I had a stove where I had to have it turned to high or medium high. I think if you have a gas stove, start with medium heat and if you have an electric stove, start with medium-high. My current oven is quite big and I think that makes a difference. My chicken needs 8 – 10 mins in the oven, when in previous regular sized ovens, it only needed 5 or 6. It also depends on how long you have cooked the chicken on the stove too. Play around with it a little and you will find what works best for you and your kitchen! My secret (or tip) for getting dinner on the table much easier during the week is to make a bunch of baked chicken breast on Saturday or Sunday. I do this every week and then I pre-make my salad lunches for the week, throw some chicken in them, and make sure that I have a few breast left over for dinners for the next couple of days. When I get home from work at 6pm to a hungry man and kid, its nice to have part of the work done for me already and dinner comes together much quicker than if I had to make the chicken from scratch every night. It’s also much easier to make healthy food choices when the protein part of your meal is ready to go. 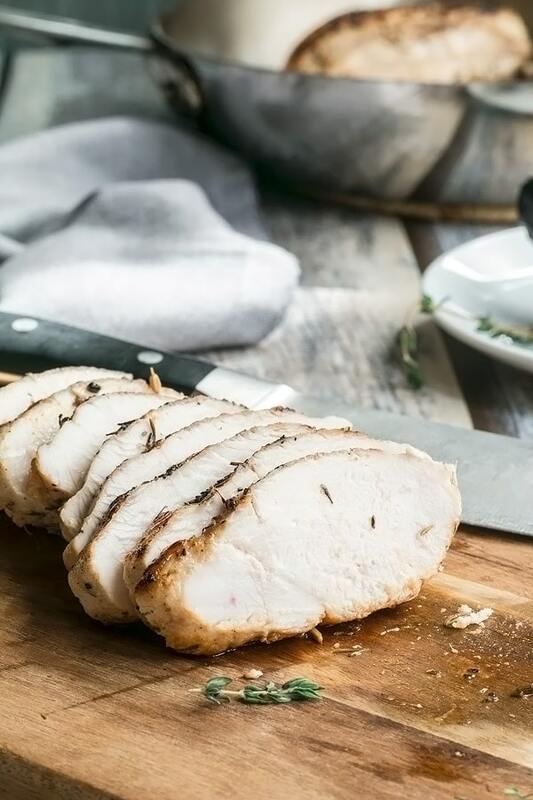 You can use this method for cooking boneless and skinless chicken breast, but you can also use it for cooking chicken with the skin on or bone in, thighs or any other part of the chicken. It’s great for getting the skin nice and crispy when you have skin-on chicken! add it to salads like this chicken salad or any other salad. Or, like my daughter, you can just eat it plain. Even plain, she always says its the best chicken she’s ever had! a stainless steel frying pan – these are the ones that both Debbie and I have. We absolutely love them and they are perfect for so many things, but especially for getting a nice sear on meat. a good set of tongs – essential for all kinds of cooking, but you need them for flipping meat both in a pan or on a bbq. If you’ve tried this baked chicken breast recipe then don’t forget to rate the recipe and let us know how it turned out in the comments below. We love hearing from you! Making perfect baked chicken breast is super easy, but surprisingly so many people don't know how. This method is the same method as the restaurants use and creates a finished product with a nice sear on the outside and a juicy, tender inside. Eat it just as it is, or chop it up and use it in salads, pasta, pot pie, or whatever else you like. Pre-heat your oven to 350 degrees. Heat an oven proof skillet to med-high heat. Cut off all the fat and any other bits you don't like. Sprinkle the chicken with salt and pepper on both sides. If you like, sprinkle the chicken with any other herbs or spices you want. When the pan is hot, add the oil and allow it to heat up for a min. Add the chicken carefully so that the oil doesn't splash you. Let it cook for about 3 mins or until it gets nice and brown underneath. Then flip the chicken to the other side. Cook for 2 mins on the second side and then slide your pan into the oven. If your chicken is boneless, cook it for 6-8 mins in the oven and then pull it out and let it rest for 10 mins before slicing it. If your chicken has the bone on it still, increase the time in the oven to about 12 - 15 mins depending on how big the chicken pieces are. When the chicken is done, remove from the oven and let it rest for 8-10 mins before slicing. One word about temperature. 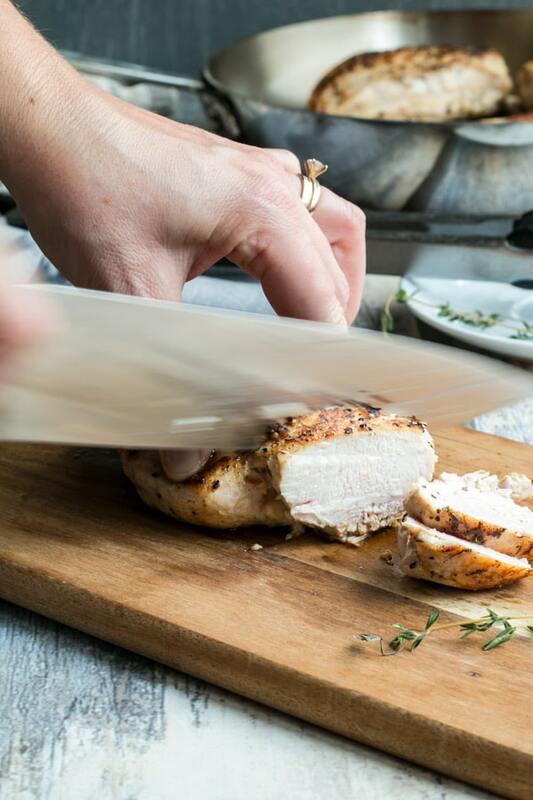 Everyone's oven and stove is a little different and it may take a little time to figure out exactly what temperature on the stove produces a nice sear on your chicken, and how long it needs to stay in your oven. For my gas stove, I get a great sear at medium heat on the stove, but I had a stove where i had to have it turned to high or medium high. My current oven is quite big and I think that makes a difference. My chicken needs 8 - 10 mins in the oven, when in previous regular sized ovens, it only needed 5 or 6. It also depends on how long you have cooked the chicken on the stove too. Is your recipe for frozen chicken or thawed? I’m wondering if I need to alter time depending on if I’m using frozen chicken in a time crunch. Hi Cassie, the chicken is thawed. I would guess that this might work on chicken that is still a little frozen on the inside (just cook it a little longer) but Im not sure about using this method with completely frozen chicken. You could try though! If you do, please let us know. The juiciest chicken breast I ever cooked!!! Omg! This was perfection! I can’t believe how delicious this chicken was and not rubbery!! So easy too!! Thank you so much!! 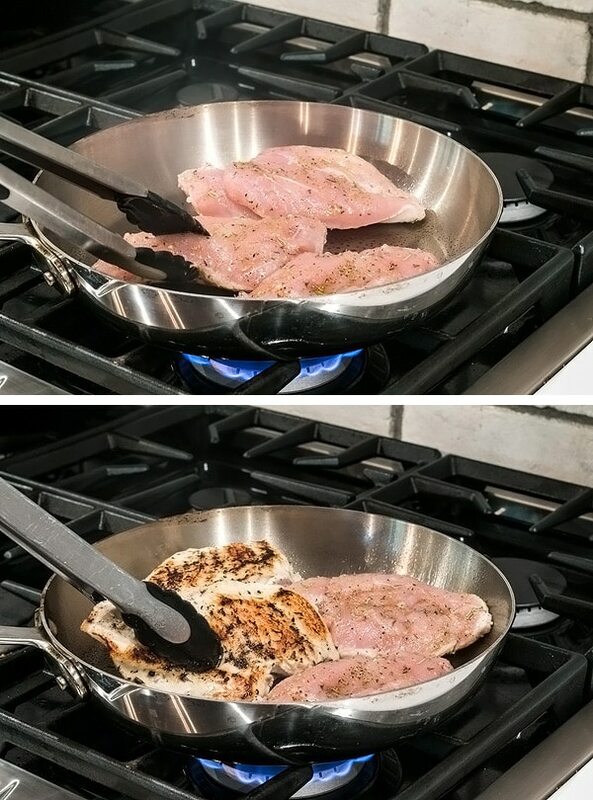 Can you possibly use this chicken method in an iron skillet? Yes, absolutely! A cast iron skillet will give it a nice crispy crust too. Can I do this in a Titanium skillet?